"George Goschen" redirects here. For his son, see George Goschen, 2nd Viscount Goschen. For his grandfather, see Georg Joachim Göschen. George Joachim Goschen, 1st Viscount Goschen, PC, DL, FBA (10 August 1831 – 7 February 1907) was a British statesman and businessman best remembered for being "forgotten" by Lord Randolph Churchill. He was initially a Liberal, then a Liberal Unionist before joining the Conservative Party by the time of the 1895 General Election. While Chancellor of the Exchequer, in 1888 he introduced the Goschen formula to allocate funding for Scotland and Ireland. He was born in London, the son of Wilhelm Heinrich (William Henry) Goschen, who emigrated from Leipzig. His grandfather was the prominent German printer Georg Joachim Göschen. He was educated at Rugby under Tait, and at Oriel College, Oxford, where he took a first in Literae Humaniores. He entered his father's firm of Fruhling & Goschen, of Austin Friars, in 1853, and three years later became a director of the Bank of England. From 1874 to 1880, Goschen was Governor (Company Chairman) of the Hudson's Bay Company, North America's oldest company (established by English royal charter in 1670). In 1863 he was returned without opposition as one of the four MPs for the City of London in the Liberal interest, and he was reelected in 1865. In November of the same year he was appointed Vice-President of the Board of Trade and Paymaster-General, and in January 1866 he was made Chancellor of the Duchy of Lancaster, with a seat in the cabinet. When Gladstone became prime minister in December 1868, Goschen joined the cabinet as President of the Poor Law Board, until March 1871, when he succeeded Childers as First Lord of the Admiralty. In the 1874 general election he was the only Liberal returned for the City of London, and by a narrow majority. Being sent to Cairo in 1876 as delegate for the British holders of Egyptian bonds in 1876,:50 he concluded an agreement with the Khedive in order to arrange for the conversion of the debt. On the resignation of Lord Randolph Churchill in December 1886, Goschen, though a Liberal Unionist, accepted Lord Salisbury's invitation to join his ministry as Chancellor of the Exchequer. Churchill had assumed he could not be replaced, and famously commented that he had "forgotten Goschen" was a potential alternative. :131 Goschen needed a seat in Parliament and so first stood in a by-election in the Liverpool Exchange constituency, but was defeated by seven votes in January 1887. He was then elected for the strongly Conservative St George's, Hanover Square, in February. His chancellorship was memorable for his successful conversion of the National Debt in 1888. He also introduced the first UK road tax, implemented in the form of two vehicle duties, on locomotives and carts. According to biographer Roy Jenkins (himself a former Chancellor of the Exchequer), "Whether Goschen was a good Chancellor is more problematical. His main and real achievement was the conversion in 1888 of the core of the national debt from a 3 percent to a 2.75 percent and ultimately 2.5 percent basis. For the rest. He was a stolid and uninnovating Chancellor." Professor Thomas Skinner says that, "Yet there remains a feeling that he failed to accomplish much of what needed to be done.". The University of Aberdeen again conferred upon him the honour of the rectorship in 1888, he received an honorary LL.D from the University of Cambridge in the same year, and he received a similar honour from the University of Edinburgh in 1890. Following the defeat of Salisbury's government in 1892, Goschen moved into opposition. Though he had been a leading Liberal Unionist as Chancellor of the Exchequer, Goschen did not stand against Joseph Chamberlain for the leadership of the party in 1892 following the departure of Hartington to the House of Lords as the Duke of Devonshire. Unable to work with Chamberlain, Goschen left the Liberal Unionists and joined the Conservatives in 1893. One obvious sign of his change of allegiance within the Unionist alliance was when he joined the exclusively Conservative Carlton Club in the same year. Caricature from Punch, 13 August 1881: "This is a Joke-'im Goschen Picture of a Wise Man from the East, at present ascertaining which way the wind blows"
From 1895 to 1900 Goschen was First Lord of the Admiralty. He retired in 1900 and was raised to the peerage as Viscount Goschen of Hawkhurst, Kent. Though retired from active politics he continued to take a great interest in public affairs, and when Chamberlain started his tariff reform movement in 1903, Lord Goschen was one of the weightiest champions of free trade on the Unionist side. In educational subjects Goschen had always taken the greatest interest, his best known, but by no means his only, contribution to popular culture being his participation in the University Extension Movement. His first efforts in parliament were devoted to advocating the abolition of religious tests and the admission of Dissenters to the universities. His published works indicate how ably he combined the wise study of economics with a practical instinct for business-like progress, without neglecting the more ideal aspects of human life. In addition to his well-known work on The Theory of the Foreign Exchanges, he published several financial and political pamphlets and addresses on educational and social subjects, among them being that on Cultivation of the Imagination, Liverpool, 1877, and that on Intellectual Interest, Aberdeen, 1888. He was President of the Royal Statistical Society, 1886-88. Goschen died on 7 February 1907. He had married, in 1857, Lucy, the daughter of John Dalley and had 5 children. He was succeeded by his eldest son George Joachim (1866–1952), who was Conservative M.P. for East Grinstead from 1895 to 1906 and married a daughter of Lord Cranbrook. Goschen appears as a minor character in the historical-mystery novel Stone's Fall, by Iain Pears. I want to leave behind me all rancid emotion. I want to be alone. I want to forget Goschen. ^ a b c d e f Spinner, Thomas J. (26 July 1973). George Joachim Goschen: The Transformation of a Victorian Liberal. Cambridge University Press. p. 4 – via Google Books. ^ "Tidy up the mess the Goschen way". Financial Times. 20 July 2011. ^ "The speech of the Chancellor of the Exchequer". The Times. 27 March 1888. ^ "The Excise Duties (Local)". The Times. 27 March 1888. ^ "Car tax disc to be axed after 93 years". BBC News. 5 December 2013. ^ Roy Jenkins, The Chancellors (1998) pp 79 – 80, for both quotes. ^ "Goschen, George Joachim (GSCN888GJ)". A Cambridge Alumni Database. University of Cambridge. ^ Goschen, George Joachim (1903). The Life and Times of Georg Joachim Goschen, printer of Leipzig 1752–1828, Volume 1. p. 3. ^ "Archived copy". Archived from the original on 9 September 2012. Retrieved 25 September 2012. CS1 maint: Archived copy as title (link) Chivalric Orders website, which notes the veracity of some of the genealogies contained are questioned by scholars. ^ A. R. D. Fairburn. "'Away from It All'". Retrieved 11 April 2015. Wikimedia Commons has media related to George Goschen. "Goschen, George Joachim (GSCN888GJ)". A Cambridge Alumni Database. University of Cambridge. "Archival material relating to George Goschen, 1st Viscount Goschen". UK National Archives. This article incorporates text from a publication now in the public domain: Chisholm, Hugh, ed. (1911). "Goschen, George Joachim Goschen, 1st Viscount" . Encyclopædia Britannica. 12 (11th ed.). Cambridge University Press. pp. 263–264. Sir Joseph Austen Chamberlain, KG was a British statesman, son of Joseph Chamberlain and older half-brother of Neville Chamberlain. He served as Chancellor of the Exchequer (twice) and was briefly Conservative Party leader before serving as Foreign Secretary. Spencer Compton Cavendish, 8th Duke of Devonshire,, styled Lord Cavendish of Keighley between 1834 and 1858 and Marquess of Hartington between 1858 and 1891, was a British statesman. He has the distinction of having served as leader of three political parties: as Leader of the Liberal Party in the House of Commons (1875–1880) and as of the Liberal Unionist Party (1886–1903) and of the Unionists in the House of Lords (1902–1903). He also declined to become Prime Minister on three occasions, not because he was not a serious politician but because the circumstances were never right. Michael Edward Hicks Beach, 1st Earl St Aldwyn,, known as Sir Michael Hicks Beach, Bt, from 1854 to 1906 and subsequently as The Viscount St Aldwyn to 1915, was a British Conservative politician. Known as "Black Michael", he notably served as Chancellor of the Exchequer from 1885 to 1886 and again from 1895 to 1902 and also led the Conservative Party in the House of Commons from 1885 to 1886. Due to the length of his service, he was Father of the House from 1901 to 1906, when he took his peerage. 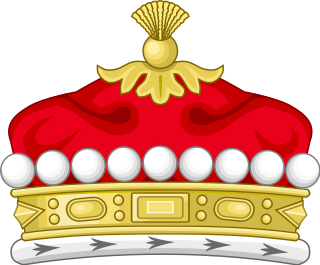 Viscount Goschen, of Hawkhurst in the County of Kent, is a title in the Peerage of the United Kingdom. It was created in 1900 for the politician George Goschen. George Joachim Goschen, 2nd Viscount Goschen was a British politician who served as Member of Parliament for East Grinstead from 1895 to 1906 and as Governor of Madras from 1924 to 1929. The third Gladstone ministry was one of the shortest-lived ministries in British history. It was led by William Ewart Gladstone of the Liberal Party upon his reappointment as Prime Minister of the United Kingdom by Queen Victoria. It lasted five months until July 1886. The Conservative government under Benjamin Disraeli had been defeated at the 1868 general election, so in December 1868 the victorious William Ewart Gladstone formed his first government. He introduced reforms in the British Army, the legal system and the Civil Service, and disestablished the Church of Ireland. In foreign affairs he pursued a peaceful policy. His ministry was defeated in the 1874 election, whereupon Disraeli formed a ministry and Gladstone retired as Leader of the Liberal Party. After campaigning against the foreign policy of the Beaconsfield ministry, William Gladstone led the Liberal Party to victory in the 1880 general election. The nominal leader of the Party, Lord Hartington, resigned in Gladstone's favour and Gladstone was appointed Prime Minister of the United Kingdom for a second time by Queen Victoria. He pursued a policy of parliamentary reform, but his government became wildly unpopular after the murder of General Gordon in 1885. Gladstone was held responsible, and resigned, leaving the way free for the Conservatives under Lord Salisbury to form a government. The National Liberal Club (NLC) is a London private members' club, open to both men and women. It was established by William Ewart Gladstone in 1882 to provide club facilities for Liberal Party campaigners among the newly enlarged electorate following the Third Reform Act in 1884. The club's neo-Gothic building on the Embankment of the river Thames is the second-largest clubhouse ever built. Designed by Alfred Waterhouse, it was completed in 1887. Its current facilities include a dining room, a bar, function rooms, a billiards room, a smoking room, a library and an outdoor riverside terrace. It is located at Whitehall Place, close to the Houses of Parliament, the Thames Embankment and Trafalgar Square. Winston Churchill formed the third Churchill ministry in the United Kingdom after the 1951 general election. He was reappointed as Prime Minister of the United Kingdom by King George VI and oversaw the accession of Queen Elizabeth II in 1952 and her coronation. George Kemp, 1st Baron Rochdale, was a British politician, soldier, businessman and cricketer. Gladstonian liberalism is a political doctrine named after the British Victorian Prime Minister and leader of the Liberal Party, William Ewart Gladstone. Gladstonian liberalism consisted of limited government expenditure and low taxation whilst making sure government had balanced budgets and the classical liberal stress on self-help and freedom of choice. Gladstonian liberalism also emphasised free trade, little government intervention in the economy and equality of opportunity through institutional reform. It is referred to as laissez-faire or classical liberalism in the United Kingdom and is often compared to Thatcherism. Sir William Thackeray Marriott, was a British barrister and Liberal and later Conservative politician who sat in the House of Commons from 1880 to 1893. The Unionist Free Food League was a British pressure group formed on 13 July 1903 by Conservative and Liberal Unionist MPs who believed in free trade in order to campaign against Joseph Chamberlain's proposals for Tariff Reform, which would involve an import tax on food. About 40 Conservative and 20 Liberal Unionist MPs attended the initial meeting. Former Unionist Chancellor of the Exchequer Sir Michael Hicks Beach became president of the group, replaced in October 1903 by the Liberal Unionist party leader Duke of Devonshire.